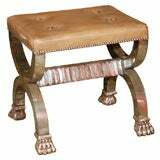 Fantastic Swedish Empire stool with giltwood lion heads and paw feet, Sweden, circa 1810. Featured in our gallery windows (photographs attached) photographed by David Prince and Jill Dienst. 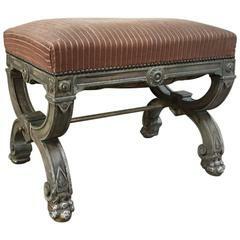 Gustavian oval stool with hand-carved fluted legs and rosettes, origin, Sweden, circa 1800. Reupholstered in gorgeous satin fabric by Rogers & Goffigon. Leather upholstered bench with floret buttons and mirrored glass lion paw legs. A pair of Swedish Empire stools manufactured during the mid-1800s. They have been dry scraped to original paint and have new padding in natural materials and new upholstery in linen. A matched pair of large Swedish Empire style painted stools circa 1970, with gilt detailing to carved decoration.